If there was a ‘Greatest Hits’ of Fiordland, then this package would be it! 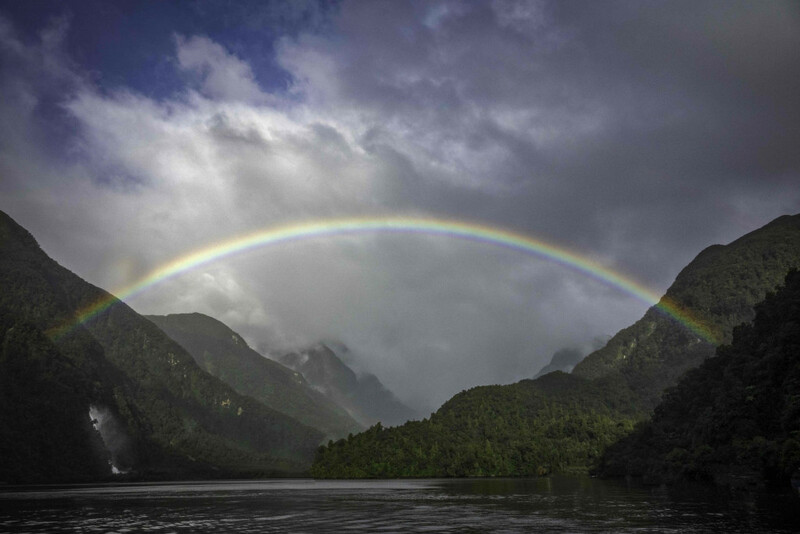 Combine a day walk on the Milford Track & short boat ride with a spectacular day trip to Doubtful Sound, Fiordland’s untouched ‘Sound of Silence’. Take the guesswork out of planning by booking this package – these are the best operators available and the feedback we get on this experience is absolutely top notch. You’ll love it! Breakfasts and lunches are available at an additional cost. 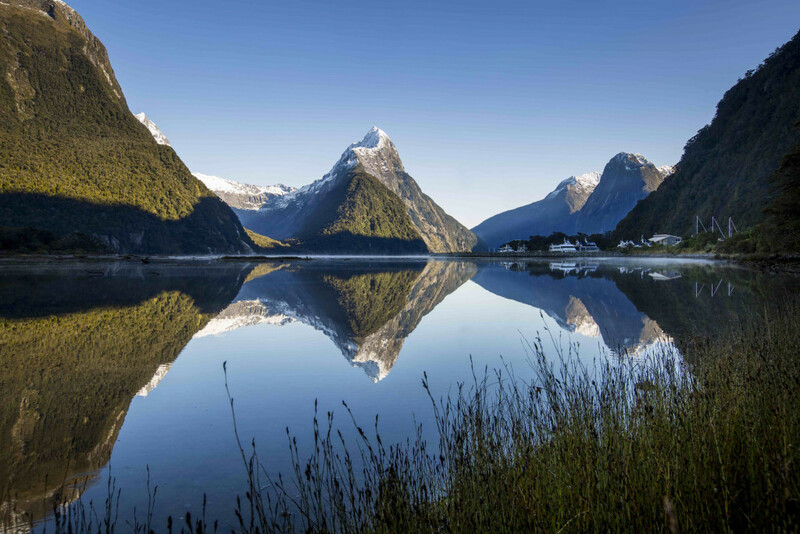 Self-drive to Milford Sound to experience the Milford Track (transport available at an additional charge). Experience a half day, fully guided experience on the ‘finest walk in the world’. 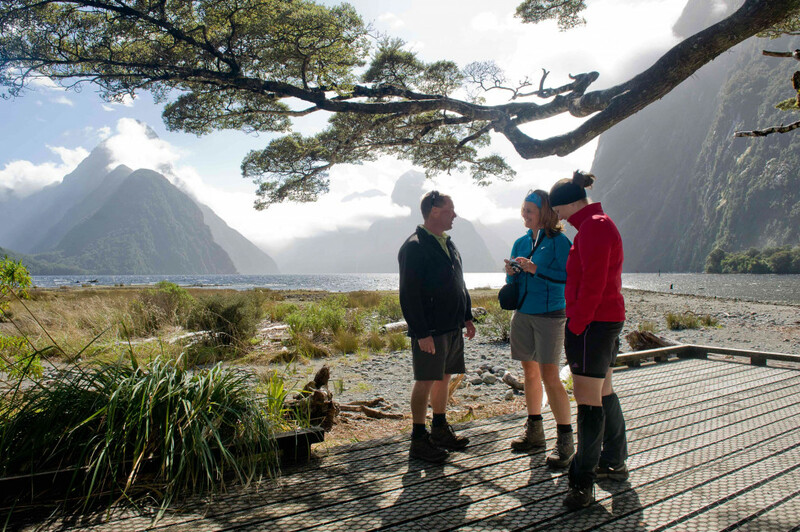 Departing from Milford Sound, this 11 km, easygoing walk meanders alongside a river to the spectacular waterfall Giants Gate and is suitable for all abilities. Your experience begins with a short boat ride across Milford Sound’s Deep Water Basin to Sandfly Point, adeptly named as you will see! This is the end point of the Milford Track, but the start of our Milford hike. From there we begin our guided walk, meandering alongside the cascading Arthur River then Lake Ada, on a well-formed track. Our destination and half way point is Giants Gate waterfall. This spectacular waterfall is best viewed and photographed from the large swing bridge spanning the river. There is much to see, from the ancient trees towering above, to the vibrant green ferns and mosses below. Walking in a small group (maximum 12 people), your Trips & Tramps nature guide will point out the native fauna and flora, and share the fascinating human heritage of the track, bringing the area to life. On completion of the walk an opportunity is made for photos at the sign marking the end of the walk, festooned with the boots of walkers that have made it to the end of the walk, not a single step further. Then we rejoin the boat for a transfer back to the Milford village. Afterwards, soak up the sights of Milford Sound itself on a Milford Scenic Boat Cruise, departing at 2.00pm with English Speaking commentary. 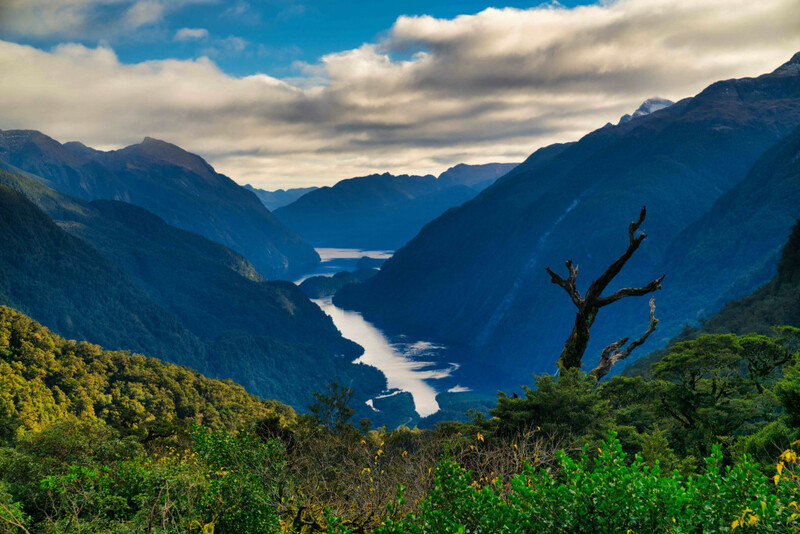 Experience a day trip to Doubtful Sound with Go Orange in a small group, with pick up from Radfords on the Lake. Your adventure begins with a 30km cruise across the crystal clear waters of beautiful Lake Manapouri. The 2nd deepest lake in NZ with its many bush clad islands, sandy beaches, and many coves and bays, surrounded by bush clad mountains – it really is a magical part of New Zealand. On arrival at West Arm spend some time browsing the information displays at the Department of Conservation Visitor Centre. Spend some time viewing historical visual & audio displays and the current modern day workings of the power station before boarding our coach again for the spectacular 22km journey over the Wilmot Pass road to Deep Cove, Doubtful Sound. On-board our spacious and well-appointed vessel, the Tasman Explorer, you will spend the next 3 hours leisurely exploring the awe inspiring beauty of Doubtful Sound. With our small group sizes (max 45) there is plenty of viewing space to take in the rugged mountains clad in dense sub-tropical rainforest, waterfalls cascading down steep mountain sides, U-shaped valleys carved out by glaciers in another age and the pristine waterways of Doubtful Sound as we make our way out to the mouth of the Tasman Sea and back. It is like nowhere else in the world. 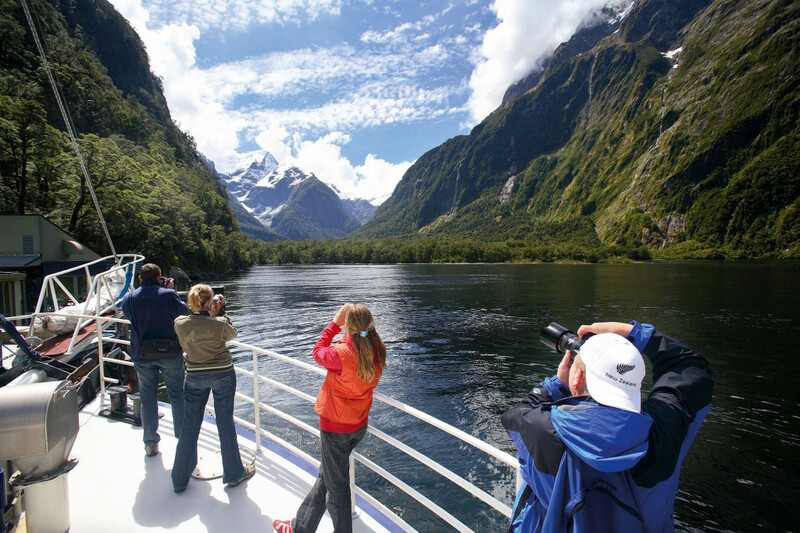 Wildlife, such as penguins, dolphins, seals & sea birds, while not guaranteed, are often sighted during the cruise through this remote part of Fiordland World heritage area.